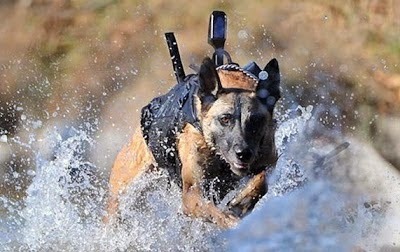 In the last six + years, we've done quite a few posts about our country's current soldiers, both two and four-legged, as well as our veterans. This year we thought we'd share last year's post that features a round-up of our previous Veteran's Day posts. We'd like to begin with one of today's stories about our country's oldest living veteran. At 109, Richard Overton, who unfortunately is hospitalized with a bout of pneumonia, had proud years of service during W.W.II, fighting in the segregated 1887th Aviation Engineer Battalion and earning the rank of sergeant. We salute you, Sergeant Overton. In 2012, for example, we discussed the history of "Armistice Day" and featured the top five picks of PolicyMic.com for the top dog soldiers since WWI. Photo of Sgt. 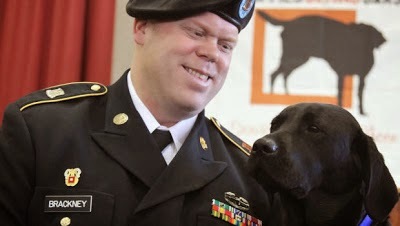 Kevin Brackney and service dog, Nyma, courtesy of CBS News. In 2013, we discussed the role that service dogs play to improve the lives of veterans suffering from Post Traumatic Stress Disorder. For last year's salute to all of our veterans, we're thrilled to take a bit of a detour from canines, and look at the role horses (in this case, wild mustangs) play in helping returning vets rebuild their lives. Take a few minutes to watch this fascinating video from CBS News and let us know what you think. Typically, Parental Unit is not in favor of domesticating wild animals (even wild horses), but in this case, it helps the horses out, too. The Bureau of Land Management's policies have been less than wild mustang friendly lately, and at least this not-for-profit program spares their lives.